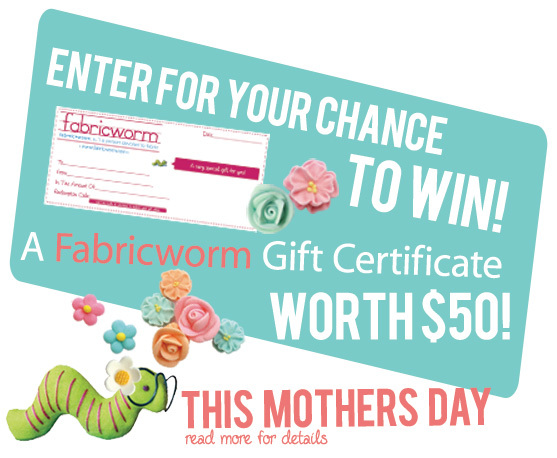 This Mother's Day we will be giving away a $50 gift certificate to our store Fabricworm.com! Keep it for yourself or give it to your mother! Everyone has a chance to win, all you have to do is leave a comment on this post answering the question below and you will be entered to win. The giveaway will end at 2pm PST, Monday, May 14th. The winner will be chosen by random.org and announced later that day! What is your fondest memory of sewing/crafting/designing with your mother? My mom taught me to sew when I was preteen - I think one of the fondest memories I have of sewing with her was in high school, when she made a dress for me to wear to a banquet. My Mom taught me to crochet when I was about 7. She guaranteed herself a ready supply of potholders. My mom doesn't sew or knit, but we did have a fun weekend of painting and wallpapering when she bought her current house. I remember in the 80's when my mom used to sew her club clothes. Once she had a shiny metallic leather bustier (crazy, I know) and she helped me make a matching one for my Barbie! I remember the sewing machine humming along at all hours from when I was about 5 or 6. When I was older, I got to help her clip apart and trim chains of potholders and baby bibs; more and more as I grew older, I was consulted about color and fabric choices for the things she created, and that made me feel proud and included indeed. I also designed one or two potholder appliqués too, as I recall. My mom was the first to teach me how to use a sewing pattern! My mom didn't sew much, but when I went away to college she did make me several things for my dorm room. When I was in junior high school my mom used to sew clothes for me and my sisters. I used to "help". Most items were made of polyester doubleknit fabric so I'm not sure if this is a good memory or not! Sadly my mom died before I started quilting -- I know she would have been my biggest fan! I subscribe to the mailing list. Thanks for the chance to win! My mom is a sewist and she had a drapery making business when I was a kid. But I clearly remember making an outfit for a Girl Scout's badge. It was a skirt and sleeveless (I think) top. The fabric was a white ribbed knit (apparently my mom was feeling brave) with puffy teddy bears on it. Awesome. When my mom taught me how to sew an Amish doll, her clothes and a matching quilt for a 5th grade project. I was so proud of what I made! I was in high school and mom and I made matching outfits. I have fond memories of my mom teaching me to cross-stitch. My mom wasn't very crafty, but it was my grandmother who taught me how to crochet while we were on a 2 week road trip when I was 6. I think she had an endless supply of yarn! My mom thaught me how to sew when I was 12 years old. I practised a lot by making clothes for my barbie! My mom isn't a crafty person, we always did craft projects with my dad! My mom didn't craft but I have very fond memories of making chocolate chip cookies together. I remember my mom teaching me the very basic basics of knitting when I was maybe 12 or 13. Breast cancer took her when I was 17. Like some girls, I saw my mom sewing for years before I ever expressed any interest whatsoever. My favorite sewing memory has to be when I decided to make a baby quilt for a friend and told my mom I would like her to teach me. She was so excited and, in turn, so was I. We whipped up that baby quilt together and I've never looked back, except to say that I wished I had started sooner. I'm on the mailing list! Thanks for the chance! My mum is a seamstress but as a child I had very little interest until I hit teenage years and suddenly discovered fashion! I used to draw up designs and get my mum to make them. Years of watching her really helped when I went off to Uni to study fashion and textiles. My mom gave me her sewing machine after I had my son and it started a hobby that helps keep me sane :P She also signed me up for sewing lessons when I was little. She didn't teach me to sew but she made sure I got the help I needed. I don't remember crafting with my mom, but I do remember sewing with my grandmother. My fondest memory is feeling the floor rumbling as my mother sewed into the early morning in her sewing room right under my bedroom. Who knew I had actually caught the bug from her all these years later. My mom taught me to sew in a time I didn't want to learn how to sew. During one summer vacation my mother "made me" sew a pajama. The truth is I did it and now, 20 yards later I am glad I did. Nowadays I sew with the same machine, my mother gently gave it to me when my interest in sewing re-borned last year. MOTHER DID TEACH ME TO SEW AND MY FIRST PROJECT WAS A LITTLE RED/WHITE SKIRT FOR ME! I WAS SO THRILLED WITH IT! WHEN IT WAS FINISHED I EMBROIDERED A FEW SMALL RED TULIPS WITH GREEN LEAVES ON IT! THANKS FOR SHARING! Mama and I were always making things together...she was very creative, and a wonderful artist. I think my fondest memory, though, is the year that my oldest girls were starting first grade and kindergarten, and the budget was tight. She drug out all her boxes of fabric, and we spent a whole week of her helping me sew them adorable little skirts, blouses and jumpers, even with matching fabric hair bows. My mother was AWESOME!! My mom doesn't sew but she is so creative. I have very fond memories of her helping me with my school projects and id often win contests because of her help! I love her! My mom used to draw simple little pictures on muslin for me to learn how to embroider on when I was really little. Yay! now all my FB buddies know about your wonderful site! Wobbling on a table while she was trying to mark the hem of a skirt I was making. I was so terrified of heights I couldn't even stand on a table! I am on the mailing list too! My mom made the best Halloween costumes ever...she made wigs, everything for them, i think Raggedy Ann was my favorite! joined your mailing list to! I remember sewing felt heart pillows for Valentines Day. We also embroidered the words I Love You on them. LOVE the Memory! My mom would take me to Northwest Fabrics in Ankeny, Ia to look at patterns and fabric. She used to make a lot of my clothes when I was a little girl. I am the last of 6 kids, 4 of which are girls, and she taught all of us girls to sew! It is something that we all have in common to this day. We miss my mother and she would love to know that we are all still sewing and quilting. My mom can't sew - at all. But she does weave, and as a kid, I'd help pick out yarns and watch her thread the loom. I'm already signed up for your newsletter! I think that my favorite was my senior prom dress that we made together. I picked out this super shiny and nearly impossible to sew with fabric and my mom and I nearly killed one another during the project but the dress turned out exactly like I pictured it would! Joining the mailing list! I have my eye on some fabrics! Ooops, I meant to say that I'm already signed up for your Mailing List! When I'm at a complete loss for how to do something when I'm sewing I can always call her and talk it out. Liked and posted your link on my Facebook for all my friends....don't know my Facebook ID but likely kasiaboslaugh. My fondest memory is two fold...when I was little less than 8 yrs old, I remember cutting up my moms fabric scraps while she would sew..second, recently, when my baby boy was born and we needed curtains in our entire house, she brought her machine down and we both whipped out a ton of curtains! My fondest memory is the clothes my mom used to make for my as a child. I look back on the pictures and now being a sewer myself realize the work, effort, and love it took to make them. Love you Mom! When I was in grade school my mom taught me to sew by helping me make some clothes for summer camp. I especially remember designing a red short-sleeved shirt with a mesh fabric on the shoulders. So cool. Sadly, not everyone learns to sew from their mom! Some moms are tomboys who had their sisters sew their high school home ec projects... But thankfully, my mom recognized my interested and utilized my aunt and a family friend to teach me! When i was about 5, my mom made me a purple flouncy dress. I remember watching her sew it, having her try it on my several times (and only pinning me once! ), and eventually I got to wear it. I wanted to wear it every day after that! I still have that dress, hanging in my closet. I remember when I was about 7 my mum made me a grey plaid woollen dressing gown. It buttoned up and she had beautifully piped all the seams with red interlock so that they didn't scratch. I was so proud of all that piping on the inside! And I remember clearly how lovely the red looked with the grey. It was yoked and the buttons were big. My mother was always unpredictable and difficult to live with due to mental illness, but I appreciate a special memory like this because it shows how she did love me, even though I often felt like she didn't. My fondest memory is of picking out patterns & fabrics for all of our high school formals, (me & my sister). All of our formals did double duty as we were also in Rainbow Girls and used the formals for those occasions too. Mum and I go to the Knitting and Stitching show in Harrogate each year for a day of crafting together. On the mailing list, too! My mom and I did lots of crafting, but I recall working on Halloween costumes and making a jester one from some old diamond patterned curtains! Really! Pinning/basting my first quilt with her. Wish we lived in the same city so she could help me baste all my quilts! Well er...we cut a shirt out never made it - I wish I had better memories of the subject! She never taught me anything about the subject, she says she's not good at teaching. She IS very into sewing and embroidery and crafts, and I like how she throws herself into stuff, even when I don't like her tastes. I am subscribed to your newsletter, and the blog on RSS for good measure. Thank you for the wonderful giveaway! My mom didn't do much sewing, so the only memories I have are sewing buttons. My right-handed mum 'tried' to teach me, her left-handed daughter, to sew, knit and chochet around age 10. Endless frustration for both of us but it couldn't have been too bad - 25 yrs later we often sew side by side on my dining table! Choosing patterns and fabric with my mom. Thanks for the giveaway! My Mom made tons of stuff with me when I was a child but when I had to go to a ball at age 15 she stayed up with me late for two weeks to make sure my ball gown got finished in time. My fondest memory would be one of the times that we went shop hopping and didn't get "lost". It is always an adventure. We get laughing so hard the driver has to pull over. My mother would take me to meetings of her quilt group when I was a teenager. I didn't know much about quilting then and I wasn't very good at it. Now we make regular trips to fabric store and I introduce her to patterns I find online. My mom used to darn my grandfather's socks and I'd watch in amazement. Then she taught me how to sew straight lines--I remember having my hands next to my cheeks as I peeked up onto the sewing table and then she lifted me onto her lap and let me help. I was in 5th grade and decided to give my sister a blouse I made for Christmas. My mom helped me make it every step of the way since I was new to sewing. I was very proud of the result. When I was first learning about quilting while in college my mom and I went to a local quilt show together. Neither of us had ever been to one and didn't know what to expect. We were totally blown away! I became a quilter, and while she did not, we still try to go to the show together every year to admire the quilts. My mom taught me to knit and crochet - we spent many hours and nights working on projects for family gift or for the church bazaar!! I am already on the mailing list - thanks!! My favorite memory is when my mom and I were making a dress and I kept running off with the pieces trying to put them on. When I was about four, I made a little figure out of junk I'd taped together. I took it to my mom and asked her to "Make a Santa suit for my Santa." The next morning when I got up, she'd outfitted this thing with a red felt coat and pants, with white trim and a black belt. It was about three inches high. I still have it, and I still don't know how she managed to do it. It wasn't funny at the time, but while at a mother daughter sewing class, when I was 7, my mom traded me to another mother. I ended up using an entire spool of thread on a tiny tube skirt and swore of ever touching a sewing machine! Which explains why my mom about fell of her chair when, at 19, I asked her to help me make a quilt for my best friend's wedding gift. I've been quilting ever since and have taught my mom how to quilt. You just won't find me constructing garments....I leave that to mom! my mom did not craft but I had fond memories of cooking with her. My Mom taught me to see when I was 5.We made doll clothes. I still have the Singer toy machine and its boxd after over 50 years! Unfortunately the last time I sewed with my mother it was during my middle school home ec class. We made beanbags (for homeless people...yeah...still doesn't make sense to me 20 years later) and I couldn't finish mine in class and had to take it home. It was a weekend full of tears (on my part) and frustration (on my mothers). Now we both sew, but separately. Wish I could sew with her, but she lives too far away! Also I signed up for the newsletter! I never did any of that stuff with my mom. She was a single mom and didn't have time for that stuff. However last summer my mom got sick and I had the opportunity to make a quilt for her (the first quilt I ever made) to take to the hospital with her. I really enjoyed making it. Mom taught me to cook, crochet and sew while I was in elementary. I was quite active in 4-H so I was always making things during the summer... Mom of course always complained about how much work it all was. Now, we just have a grand time finding projects and sending pictures of our creations to each other (and we both are glad we don't have to impress a judge!). My mom does sew... or craft... or design... but she's always been encouraging of my love of sewing... crafting... designing... anything! She's always been so supportive and encouraging. That has always meant a great deal to me. Mom was the best at sewing and taught me to make clothes when I was in high school. Last winter she said I have surpassed her but that's not true! I have her old Singer 301. I am on ur mailing list! Thanks for the awesime giveaway! When I was pregnant my mother and I made and smocked bishop dresses and bonnets for my daughter. We had a great time, and I saved the clothes for my daughter to use if she has a little girl one day. My best memory of crafting with my mom was when I was about 7 I remember her trying to teach me how to crochet.... I did a chain and couldn't figure out how to do anything else...no matter what she told me. I made a chain taller than me! Thanks their the chance to win! My favourite sewing memory was learning how to sew with my grandma and my mom. I'm already on the mailing list, thanks for the giveaway! I signed up for the newsletter. I am looking forward to reading it! My Mom dyed a pair of long underwear reindeer brown so that I could be Rudolph in the kindergarten Christmas program. My mother is my quilting mentor. She is 81 so any day that we can quilt together is a great day! Today she was lap handquilting her quilt as I was handsewing hexies for my seven year project of a GMFG quilt. Thanks for the giveaway. If I am so fortunate as to win, then will "go shopping" with her at fabricworm. My Mom didn't sew much, but my Grandmother was an amazing seamstress and I remember fondly watching her at her machine. I learned to hand sew and crochet from my mom and had "follow-up" from my aunt and grandmother who kept me, my sister and cousins after school while my parents worked. I also remember my mom sewing on her sewing machine. My mom isn't a crafter at all - I'm not sure she even knows how to run a sewing machine. But I enjoy making things for her and know that she appreciates the work I put into them! My mom helped me rip all of the seams out of a blouse I was trying to make when I was in 8th grade and then she helped me read the pattern correctly to put it all back together again. I used to love just watching my mom sew clothes for my dolls. They were so perfect even in minature. I hope one day I have a daughter to share some special moments with. When I was 11/12 my mom bought me my first sewing machine and materials to get me started making yarn bunny dolls. She even helped me sell a bunch. My mother is not a sewing/crafting person. I actually got my interest in sewing from my grandmother. She sewed my Mom's clothes until she was a teenager and sewed a lot for herself. Thanks for the chance to win! Sharing fabrics for projects. We are both chronic savers. I'm on the mailing list - thanks! My mom and I got the bright idea to make my winter "formal" dress when I was a sophomore in high school. It was an absolute disaster, but thankfully we were able to laugh it off pretty quickly. My mother was a quilter. I remember stapling together doll pillows made from her fabric scraps while she sewed doll clothes and blankets for me. She died before she could teach me to sew, but I have her quilts, sewing machine and memories to keep me company when I do my own sewing now. I'm already signed up for the newsletter - love to see it pop into my inbox! My mom was good about getting me supplies for my crafts and sewing but she didn't really get into making things with me. I could always count her to give me good advice tho, and to compliment my efforts! Thanks for the chance to win! My mom sew to me a FLAMENCO DRESS, with dots for school, It was red con black dots, really beautiful, y put the half the dots sewing by hand. Added your giveaway to my Facebook page! Mom was not a crafter at all. Barely remember her sewing on buttons. But lve her just the same! My Mother was not a sewer, crafter or designer as she was busy raising us nine children. I do remember receiving a whole shoebox of clothes for my babydoll for Christmas one year that were designed and sewn by my Maternal Grandmother though. I still have a few of them and she was amazing.